National Ice Cream Day is coming up (Sunday, July 20th). Kick off your day of Bacchanalian gluttony by deciding which of these insanely delicious sundaes and ice cream flavors you'd most like in and around your mouth. We've even got a handy map to help you figure out how much time lies between you and your one true ice cream love. Ready to dig in? Sweet Action Ice Cream (Denver, Colorado) Known for: milk chocolate. With always-changing, offbeat flavors like blueberry waffle, garam masala (I don't know what it is, but I love it), avocado, and maple pale ale, it may seem foolish to order one of the most basic flavors on the menu, but their milk chocolate is legendary. It's a far cry from the freezer-burned carton of chocolate in the back of your freezer— one bite will make you question everything you ever thought you knew about milk, chocolate, milk chocolate, and ice cream. Sweet Republic (Scottsdale, Arizona) Known for: Toffee Banofi sundae. The Toffee Banofi sundae is a brilliant twist on the banana split. Seriously, whoever thought of this should be in school textbooks next to Einstein and Edison. It's made with vanilla bean ice cream topped with fresh bananas, toffee brittle, and whipped cream and drizzled with salted caramel sauce. AND, as if things couldn't get better, it comes in a waffle cone bowl. If that doesn't make your mouth water, then you should have your tastebuds checked. Toscanini's (Cambridge, Massachusetts) Known for: burnt caramel. Tosci (as the locals call it) has a cozy coffee shop vibe, and while they do brew java, they also make a mean burnt caramel ice cream (among roughly 40 other equally awesome flavors)— and if you're feeling like eating healthy (although why you'd do that to yourself when you're at an ice CREAM shop, I'm not sure), they make it as a frozen yogurt too. Amy's Ice Cream (Austin, Texas) Known for: Mexican Vanilla. Once again, basic doesn't have to mean boring. This rich, sweet delight starts with a sweet cream base and has ample amounts of Mexican vanilla added in. Besides, the advantage of ordering a scoop of this vanilla is that it pairs well with just about any other flavors that Amy's offers: try it with their apple pie, Brandy Alexander, Chai tea, custard donut, or maple bacon— and that's just naming a few! I don't think Willy Wonka himself could come up with a more delectable menu. The Creole Creamery (New Orleans, Louisiana) Known for: Creole cream cheese. You may want to invest in the 6 for $6 sampler because this New Orleans parlor offers a lot of options— but make sure to make one of them the Creole cream cheese. It's a tangy and sweet confection made with a local type of curddled cream cheese. Sorry if that sounded unappetizing, but it really is tasty. If that sampler still wasn't enough to curb your craving for ice cream, then try to tackle the Tchoupitoulas Sundae Challenge— 8 scoops of ice cream, 8 toppings, and a pile of whipped cream, cherries and wafers. Those who finish the challenge alone will be immortalized, like the Hercules of churned and frozen sweet cream, in their Hall of Fame— but the real prize is how delicious the ice cream is. Molly Moon's (Seattle, Washington) Known for: melted chocolate. Just the image that "melted chocolate" elicits makes this flavor stand out about other chocolates. I mean, it's impossible to pour a regular chocolate bar all over your body (I know- I've tried). There's something super decadent about "melted chocolate" and the fact that it's made with organic, fair trade cocoa from local sweet shop Theo's makes it even better. Bubbies Ice Cream (Honolulu, Hawaii) Known for: mochi ice cream. It might look weird to people who have never seen it before, but stay with me here. Bubbies serves the truffle-like mochis, which are essentially little scoops of ice cream wrapped in a shell of Japanese sticky rice, in several flavors. They also serve up scoops and slices of ice cream pie for the unadventurous. It's worth it to try at least one mochi; you'll probably wind up going back for another. Ample Hills Creamery (Brooklyn, New York) Known for: salted crack caramel. This addictive, sweet and salty flavor lives up to its name— salted butter caramel ice cream is loaded with bits of crack cookies, which are made chocolate, butter, sugar and saltine crackers. In fact, people get so hooked on the flavor that they keep coming back for more, and it frequently sells out. Junkies, make sure to get there early for a fix. Bi Rite Creamery (San Francisco, California) Known for: The Trifecta. This magical ménages à trois is a staff-approved favorite. You get one scoop each of their salted caramel flavor, the brown sugar with ginger swirl, and the malted vanilla, and it's topped with peanut brittle and chocolate— the perfect complements to the rich, sweet and salty sundae. I want in on this three-way. Moomers Homemade Ice Cream (Traverse City, Michigan) Known for: cherries moobilee. It's like cherries jubilee but a million times better, since it's been mixed up into sweet, dreamy ice cream and because there's no dangerous flambe-ing involved. The black cherry base is loaded with sweet black cherries, a chocolate swirl and chunks of chocolate brownies. You can also tour their dairy farm or the ice cream store (which includes an ice cream tasting-how fancy). Tom's Ice Cream Bowl (Zanesville, Ohio) Known for: Tin Roof Sundae. This local gem has been scooping up sundaes since 1948. The old-school atmosphere is actually authentic, and the ice cream is to die for. The tin roof sundae is a simple scoop of ice cream topped with warm, gooey hot fudge and salty, fresh-roasted peanuts. Nothin' too fancy, but it's guaranteed to satisfy any sweet tooth— to the point of maybe giving said sweet tooth a gnarly cavity. Still worth it. HONORABLE MENTION: Jeni's Splendid Ice Cream (Columbus, Ohio) Known for: Salty caramel. 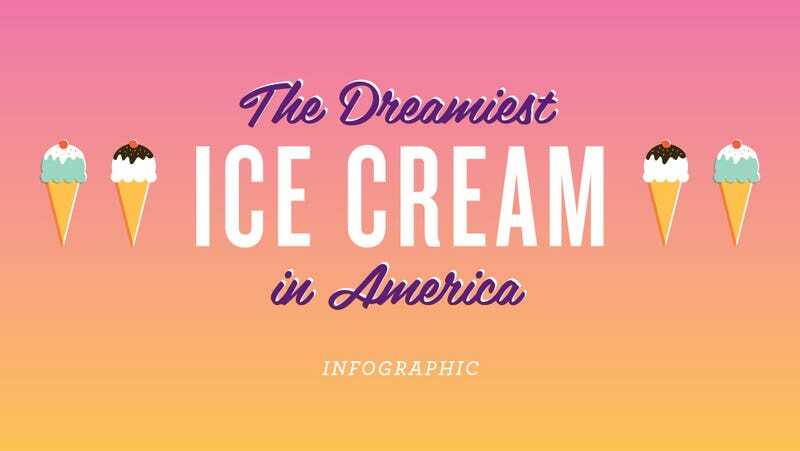 Jeni's has spread out to bring the Good News of its ice creams to several states, but stop into one of the original locations in Ohio for a scoop of homemade goodness. Their salty caramel is a classic that pairs well with their dark chocolate, Buckeye State or my personal favorite, brown butter almond brittle. What do you think? Did we miss any? Find your favorite with our interactive map and let us know in the comments below! America's Dreamiest Ice Cream | My Bucket List itinerary on Roadtrippers.com!